Ronald died. Emily had him cremated. She buried the ashes beneath the roses in the backyard. Ronald had habits that Emily liked. They were outweighed by habits that she did not like. These habits broadened over time, like the pounds above Ronald’s belt. Take the business about being at the kitchen sink, rinsing and scrubbing, while she still was finishing breakfast or dinner or whatever. Ronald got this habit from his mother, who died at ninety-six raking leaves on Emily’s front lawn. Ronald was especially fond of his mother, who cubed his watermelon and cantaloupe when he was a boy. “I like to make things shine,” Ronald’s mother said, fussing about Emily’s house with a dust cloth or a broom when what Emily wanted was to sit still and visit. Emily hid the broom in the bedroom closet finally and stuffed the dust cloths into the pantry behind the canned vegetables and the bag of flour. No matter what Emily did, there was Ronald’s mother, fluffing cushions in the living room, scrubbing the kitchen sink, straightening the towels in the bathroom. When she could do no more inside, she sat on the front lawn, stabbing at dandelions and crabgrass with one of those tools Ronald kept in the garage. How could Emily ever hide Ronald’s tools? He couldn’t tolerate a plate or a pan crusting. He couldn’t tolerate residue firming in a pot. Emily, who could not eat as fast as Ronald, watched him and listened. He loaded the dishwasher. He ran the disposal. She pushed the toast or a bit of steak into her mouth. She chewed as fast as she could. She wanted to sit quietly, eat slowly, and talk with Ronald. But Ronald had to be up, scraping or wiping. Emily felt as though she ate in a cafeteria. Then there was the television. Emily loved the situation things. She loved the half-hour series where everything hung in the balance. Ronald liked The Western Channel, black-and-white movies with Tim Holt or Tex Ritter. Emily could not stand Tim Holt or Tex Ritter. She sat complacently, looking at horses, wagons, six-guns belching smoke, and cowboys fighting in the dirt until she could stand it no longer and had Ronald set up a small television in the bedroom, where she could watch Lucy reruns or movies about people struggling to love each other and succeeding in the end. They did watch the news together, though Ronald preferred Fox, while she liked CNN. There was some neutrality regarding the History Channel, except when Hitler came on, and the National Geographic Channel was fine, or one of those channels with animals. But if Ronald switched to American Pickers, or those things with scruffy men in plaid shirts cutting trees in British Columbia, or things with swamp people wrestling alligators, she retreated to the bedroom and the Cooking Channel, or Turner Classic Movies, or one of those fashion channels where they had so many nice things for sale. None of this had been anticipated during their courtship. Something bright was squeezed into the corner of a cupboard, where it languished, hidden and unused, in the dark. Then Ronald’s mother collapsed into the dandelions and crabgrass. Emily was frightened but relieved, not in some evil sense of being relieved, but in an existential sense, like seeing the doctor and discovering that there was nothing to worry about. When Ronald died, Emily thought that she had made him take his pills on time, that she had done what she had to do. Ronald was not well those last years anyway. All that about lungs and heart and kidneys. He was through, like a rusty spring unwound. Emily was so old herself that a future was unimaginable. No polishing could make things shine again. All was simply, over and over. One day, someone knocked at the front door. Emily moved the curtain. An old man stood on the threshold, pulling at a red cardigan sweater. “Who is it?” Emily called through the door. Emily did not know any Bert, but she liked being called Em. She opened the door. “Hello?” she asked at the old man. “Then?” Emily asked. “What then?” She was becoming suspicious. She had once liked a linebacker or guard or whatever it was on the football team. She remembered him squatting, one fist against the grass, the other fist on his leg. She remembered him from one or two classes, social science or biology or maybe even Spanish. The boy was tall and strong. He had very wavy, black hair. Before her now was a bald man, so shriveled and stooped that there was nothing to remember except, perhaps, the eyes. Bert Thalhammer’s eyes were gray, so gray that she had not seen such eyes then or since. She looked. Behind the wrinkled lids and pouches, the eyes were quite gray. There were no other eyes like those eyes. “My wife, Barbara. We met in college. She died.” His face puckered. He turned to look at the sycamore tree that Ronald had planted all that time ago. The sycamore was forty feet high. “We were fifty-eight,” Emily said. She remembered exactly the gray eyes and how she had liked looking at them. She remembered the lights above the stadium and the grass, greener than green. She remembered singing about running the ball clear round to victory. “Bert Thalhammer,” Emily said. She smiled. “Would you like a cup of coffee, Bert?” she asked. They went into the house. Bert sat on the sofa. She got everything ready in the kitchen and brought the cups of coffee on a tray with a few oatmeal cookies she had made the day before. Bert drank the coffee. He ate two cookies. “Have you lived here long, Em?” he asked. “All our lives,” Emily said. “It’s a beautiful chest,” he said. Emily sipped from the coffee cup. Bert reached for another cookie. He nodded. “Me too. No kids. No brothers. No sisters. No anybody, for that matter. Just me, myself, and I, Em.” He tried to smile. She tried too. They sat. A few cars went by on the street. “I know about quiet,” Emily said. He set the half-finished cookie on the edge of the saucer. “You don’t cook much nowadays, I suppose,” he said. He looked at the cookies arranged in a semicircle on the plate. He sat back in the chair and crossed his legs. “It would be nice,” she said. Bert picked up the list Saturday morning. It was a list for two filets, two potatoes, a bag of mixed vegetables, and a fancy dressing she had heard about on The Food Channel. On the list were things she needed to make a pineapple upside-down cake and those little appetizers with the creamed cheese and red pimento. She wrote down Pinot Noir for the wine because she had never tasted Pinot Noir. Bert bought everything and a few extra things he saw on the shelves, like whole wheat crackers, avocado dip, and a wedge of cheese with tiny specks of blue. Emily was glad in the kitchen that afternoon. She set everything out, took her time and put everything together. She wore the green dress and the tiny pearl necklace Ronald had given her. She wore the open-toed shoes that were for sale on the Fashion Channel and so comfortable. She wore a hint of the perfume she had saved from Macy’s. She wondered why she went to all the bother, except that it was pleasurable to be bothered again. Bert came promptly at six. He wore gray pants and a blue cardigan exactly like his red cardigan. He ate slowly. He sipped the wine. In no time, they had been at the table an hour before she served the pineapple upside-down cake and the decaf coffee. He laughed. They went into the living room to talk some more. “I guess we do,” she said. Two nights later, he took her to Alustizas, an Italian place in the middle of town. The waiters wore black shirts, black pants, and white bow ties. Everything on the menu was twenty dollars and above. Candles were on the table. Emily was embarrassed to order something, but Bert said, “Order whatever you like, Em,” and proceeded to choose a bottle of wine that cost seventy dollars. Emily felt a catch in her throat at spending such money just to eat. It all came, with the tip, to one hundred seventy-five dollars. It was a lovely place. Lots of floor-to-ceiling glass and redwood trim, and a lawn larger than her entire lot in town, and pine trees he had planted around the perimeter. Except for the bedrooms, there were no curtains on the windows. The darkness painted the windows black, but she was surprisingly unafraid, looking from a room into so much night. “It’s like singing, in a way,” Bert said. There were so many nice things with Bert that Emily decided it would be fine to prepare dinner at his house. She used Barbara’s pots and pans. She used Barbara’s oven and burners. She served with Barbara’s plates and silverware. She used Barbara’s napkins to wipe her mouth. She poured coffee into Barbara’s cups. The pound cake was made with Barbara’s mixer and things from Barbara’s refrigerator. She loaded Barbara’s dishwasher. There was Barbara’s furniture and Barbara’s bathroom and Barbara’s hand soap and Barbara’s towels and Barbara’s little trinkets here and there, on the mantel and the end table, and Barbara’s magazines in the slatted rack. She went through several dinners with Barbara’s things. Then, one night at her own place, Bert had something more to say. “It is nice to talk about so many things, Bert,” she said. Emily did not know what to say. Bert was different in so many pleasant ways from everything that was the same. Emily spent several days thinking. She understood perfectly about Bert, about how everything with Bert was as it was because of everything about Ronald. Bert needed a companion while he walked slowly through the dry grass to someplace beyond the hill, and she discovered that it was possible to lose again what she never knew she had. After a time, Bert did not come by. He was elsewhere, she thought, knocking on another door with an offer someone could not refuse. Emily bought a cat. She did everything for the cat. She got rid of the television in the bedroom. She sat on the sofa with the cat, watching the big screen. She watched the things with men in scruffy shirts and men who swore while hunting alligators. She watched Fox News. One afternoon, sitting on the front lawn, working with Ronald’s tools, she felt something peculiar in her chest and fell forward into the dandelions and crabgrass. 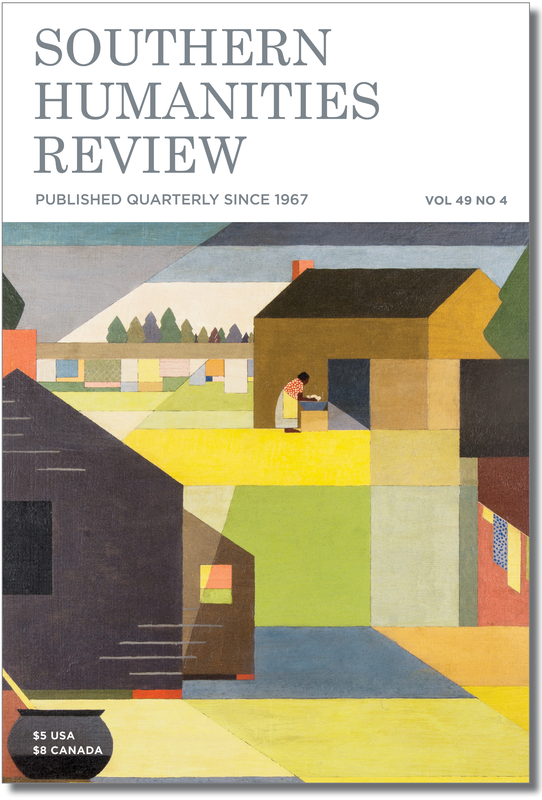 This is RICHARD DOKEY’s fourth appearance in Southern Humanities Review. He is a former winner of SHR’s Theodore C. Hoepfner Literary Award. His stories appear regularly in literary journals, and he has a number of books to his credit, including Pale Morning Dun: Stories and the novel The Hollywood Cafe.